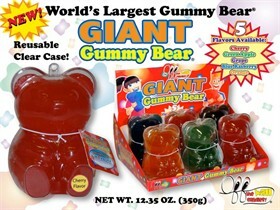 Giant Candy Makes a Great Gift for Christmas! Giant Gummy Bears – Nope, they aren’t an urban legend. Neither are they in a cage at a roadside carnival alongside the bearded lady or world’s tallest man. They’re right here at Blair, and they’re as delicious as they are delightful! These chubby fellas are a staggering 4 inches tall and 2 ½ inches across. Think of your average gummy bear and it’s easy to see one of these could serve as their gummy god or goddess! Packaged in a clear case to keep them clean between snackings (chances are good you won’t finish this all at once! ), these make a really unique gift for just $3.50 each. Giant Hershey Bar – This candy car isn’t messing around! It could crumble fun size bars with a passing glance, and leave classic size bars breaking into blocks with the sheer magnitude of its S’more-making possibilities. 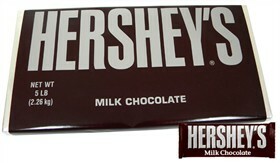 This Hershey bar is more than a handful or mouthful at a whopping 5 pounds. Yup, FIVE POUNDS of pure Hershey heaven. One weighs as much as some newborns! Two weigh as much as a bag of potatoes! Giant Jawbreakers – Whether you choose ‘The Bruiser’ or ‘Psychedelic Sours’, these jawbreakers are a definite multi-day snack. 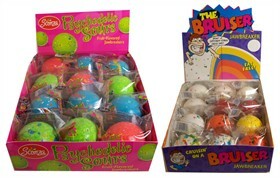 Each box holds 12 individually wrapped giant jawbreakers, making these colorful candies less than $2 apiece. A fun take-home treat for a holiday party, or a sweet stocking stuffer for someone with quite a few socks to fill, we recommend giving your tongue a break once in awhile with these. The temptation to keep licking will be strong, but talking, breathing and drinking are important, too! Stocking Stuffers That Look Good Enough to Eat…Because They Are! 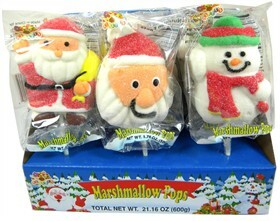 Marshmallow Christmas Lollipops – Ooey, gooey goodness in Santa and Snowmen shapes, these plump lollipops are almost too cute to eat. Except, well…no matter how cute they are I’ll eat them anyway! Just don’t eat them too close to the fire. Santa is a winter weather kinda guy, and we all know how well snowmen handle the heat. There’s a song and a movie about it and everything. Milk Chocolate Hershey Snowman – Generously-sized at 3.5 ounces, this festive little fella is the perfect culinary complement to the Christmas lollipops above. Sometimes the simplest sweets are the best, and Hershey’s reminds us of that time and again with every holiday-themed incarnation of their classic milk chocolate bar. Or should we say mmmilk chocolate bar! Gummy Peaches – With the marshmallow and chocolate food groups taken care of, it’s time to freshen the palate with something fruity and fun to wear on my fingertips. Yup – gummy peaches! Starting with the left hand, I push a gummy peach to the top knuckle of each finger, excluding the thumb. The right hand is next, and it’s admittedly a tad bit tougher with gummy peaches already on every finger of the left hand. Nevertheless, I press on! I then happily wiggle my 8 peachy digits at anyone who will pay attention to me, before consuming them one at a tasty time. Now that you know a little more about my CMA, I’d love to hear about yours! Will you be sitting in your own recliner working your way through the candy food groups your stocking holds, or do have different traditions you’re looking forward to this year? From Empty to Awesome – Our Candy Boxes are Ideal for Sharing Sweets for the Holidays! With Christmas just a few short weeks away, many of us are making our gift list and checking it twice. And just as it seems to every year, it has grown! While this does mean we have the task of finding suitable gifts for more people, with some careful planning it doesn’t have to mean finding more money for those gifts. And on the big, bright side, it often means there are more people in our lives we truly appreciate, and that’s hardly something to be upset about! From kids to cousins to aunts and parents, there are quite a few people on many of our lists whose presents must be carefully planned. But there is also a long list of people who we want to share a little holiday cheer with, but for whom we needn’t gift something of great expense or personalization. These people might include your mailman, hairdresser, pet groomer, next door neighbors and your children’s teachers. These are all important people, and often friends, but not everyone can get an Xbox or iPod! But what everyone can get is also something everyone can appreciate – candy! It likely comes as no surprise that I often give candy as a gift. Sure, it’s an easy one to give, I’ll admit that much. But it’s also a fun gift to give and receive, especially when working with a theme and adding a special touch. The best way to do just that? By filling empty candy boxes with tempting treats and adding stickers, ribbons and bows. 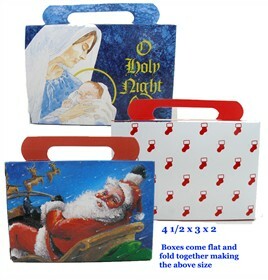 You can also save yourself the time of customizing your own boxes by choosing our empty Christmas candy boxes, available in 3 pretty patterns that are perfect for the season. You can choose to fill your candy boxes with an assortment of popular candies, or opt for a theme/type and choose candies that complement that. Not sure where to begin? Below are 3 easy ideas that are sure to be appreciated! Nosh on Nostalgia – There is possibly no other holiday that inspires nostalgia quite as strongly as Christmas. Whether we are 15, 50 or 80, thinking back on Christmases of the past is an emotional experience to say the least. Whether you’ll be sharing your candy boxes with people who will remember the treats in our nostalgic candy collection, or want to share some of your favorites with a younger generation who may have never tried them, a little blast from the past in a box is sure to inspire some very genuine smiles! Depending on the candy era you opt for, some box-friendly options include: Atomic Fireballs, Broadway Licorice Rolls, Teaberry Gum and a sprinkling of Satellite Wafers! Tempting Taffy – The variety of quality taffies available at Blair Candy is nothing short of terrific. I’m not sure I ever realized how many delicious options we offer until just now, so bear with me while I toot the Blair horn! There’s always-popular Laffy Taffy, colorful and supremely sweet Flipsticks taffy, fun-to-smack-it-and-crack-it Bonomo Turkish Taffy and many more. Just be sure not to give one of these boxes to your dentist! All About Red and Green – Perhaps you simply want to celebrate the colors of Christmas in your assortment? Well, with red and green being 2 of the most common candy colors, there’s no shortage of box-worthy options! There’s Green Apple Tootsie Frooties, Hot Tamales, Gummi Army Men, Zagnut and so much more. There’s also a whole section of Christmas Candy that is primarily red and green, so your options for this theme are seemingly endless. Have fun filling your empty candy boxes and creating affordable, memorable gifts for the many people who make life that much better! Decadent Dessert Ideas from Taste Of Home! With Halloween now behind us and Thanksgiving on the horizon, my mind has been swimming in savory thoughts of juicy turkey, flavorful stuffing, fluffy mashed potatoes, buttery crescent rolls and my sister’s culinary masterpiece, oh-so-amazing-I-can’t-stop-eating-it zucchini casserole topped with melted cheese. There is little debating that when it comes to ‘food holidays’, Thanksgiving takes the turkey! But did you know Thanksgiving could take the cookie as well? Take the cookie and turn it into a delightful dessert that is fun for the whole family and delicious, too? Well…it can! 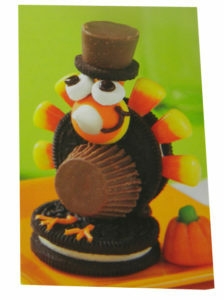 Turkey Pilgrim Cookies – The first candy-covered dessert to catch my eye was the Turkey Pilgrim Cookies. These are almost too cute to eat, but I think if I close my eyes I can manage! The recipe calls for the following ingredients, which should give you some insight into what makes these so good: Oreos, candy corn, miniature peanut butter cups, candy corn kisses, chocolate frosting, vanilla frosting, mini marshmallows, mini Oreos, Rolos and orange food coloring. And the best part, other than all the tasty ingredients, that is? There is absolutely no baking required! The frosting serves as a ‘glue’ of sorts for all the candy and cookie building blocks making these a dessert the little ones that can help put together. As there is no baking required, the kids can create these while you’re cooking to keep them busy, or it can be a fun family project the night before. Pilgrim Hat Cookies – Just like the Turkey Pilgrim Cookies above there is no baking required for these yummy treats. Ingredients include: vanilla frosting, yellow food coloring, orange mini Chiclets, miniature peanut butter cups and fudge-striped cookies – that’s it! These are even easier to create than the Turkey Pilgrim Cookies, though I have to admit they aren’t quite as cute. What can I say – a dessert with marshmallow eyes wins my top vote! That said, I plan to make both cookie and candy concoctions this season, if not for Thanksgiving itself as a fall-themed snack for anytime. After all, with so much amazingness on Thanksgiving day, and the days full of delish leftovers that follow, I want to give my candy-packed desserts an opportunity to shine. The Thanksgiving Recipes Cards issue of taste of home is $4.99 and marked for sale through November 22, 2011. Grab your copy the next time you hit the grocery store, and check out more great recipes on TasteOfHome.com today!